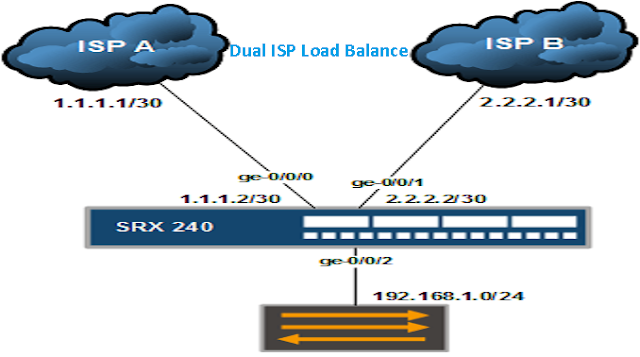 There are different methods for load balancing internet traffic in Juniper SRX series devices. Two of them are per flow load balancing and filter based load balancing. You can use any method to load balance dual ISP internet in Juniper SRX or MX series or J series devices. Here, I will load balance dual ISP internet in Juniper SRX device using per flow load balancing method. The diagram below shows our existing scenario. We have two ISPs that we want to load balance the internet traffic to. Two internet links are in UNTRUST zone whereas the internal network is in TRUST zone. I have already configured required security policies. The first step is to define routing policy. Configure the following policy under [edit-policy-options] hierarchy. Now, configure the routing policy called LOAD-BALANCE under the routing option. Type show command to view the configuration. You can now view route forwarding table to verify. You will see two next-hop MAC addresses for default destination network. By default JunOS include only layer 3 IP address to determine the flow but you can change this behavior and include both layer 3 and layer 4 information. To do so, hit the following command under [edit forwarding-options] hierarchy. You can now see the logs or even do tracert from client PC and test the load sharing. You can test from a single PC in the network.